“Please hang up the phone and call back in a month” – more adventures in PIP application. As you read this I will be somewhere between Cornwall and Bristol I imagine, but I did want this to go out today as it’s my 5 month PIP-iversary today. Hurrah! Well, now, let’s be fair. It’s five months since my claim was opened. It’s only FOUR months since I sent it back to the DWP so they could throw it at ATOS to wait in a large pile for months. Because I wouldn’t want the DWP to look like they were taking an excessively long time about it or anything. I have gone onto and off medications. So, long story short, what’s on that form bares a passing resemblance to me in January 2014. It really doesn’t bear any resemblance to me in June 2014. Unsurprisingly. But when I finally do get the letter that says they want to poke at me and see if I am what I say I am, they’re going to base their assessments on what I said in January. And then when I get a letter saying I’m not eligible for PIP (I am both realistic in my thinking and looking to the worst outcome as to not disappoint myself) I will have to appeal with my new situation, my new medications, my new symptoms. So they can take another 6 months to look at it. By which point it will more than likely have changed again. Do you ever get the feeling you’re chasing your tail? That you’re running round in circles? At some point this week I will call the DWP, again, and see if my form has seen any daylight since February. And then I’ll wait another month. I cannot fill this form out. I mean, literally. I cannot fill this form out. I spent a large part of Friday beginning to work on it. The technique I used was to write all my answers on paper so I could look through them, change them and then get them checked by someone ready to put on the form. It feels like I’m writing a thesis paper – do drafts, get it checked, write it up ready for submission. Since Friday I’ve got as far as question 6. I’m exhausted. The act of completing this application is in fact making me sicker. I’d been completing it by doing a question, taking a break, doing a question, taking a break. I phoned a local disability charity last week, who called me back yesterday and said I could go to a drop-in tomorrow to get someone to look over the form with me. This means that I really need to have the questions filled out “in draft” by tomorrow morning. I have nine more questions to do. I am someone who knows a fair bit about benefits, who has a husband who’s already completed a DLA form and who knows where to go for help and assistance if I need it. I can drive myself (subject to pain levels and “how zonked on painkillers are we today?”), I can go to places to get help and I’m capable of going and seeking that help and yet this form is exhausting me. What if I was someone who didn’t have that help, who lived on their own or who had mental health problems that prevented them from going to an outside agency? THIS is why people aren’t claiming Disability benefits when they’re entitled to them. The Catch 22 of disability benefits is that if you’re disabled enough to need them, you’re too disabled to apply. This post is a bit of an update to a change in my life, and a blog that’s going to come out of it. You may remember this post from May last year, where I talked about our flat becoming flooded. Well, that turned into having to live in temporary accommodation for four and a half months. We moved back into our flat in the middle of September last year. At the end of October, I stopped working due to illness. At the beginning of December, my GP provisionally diagnosed me with fibromyalgia. At the moment I’m not sure what’s going to happen re. work and so on. I’m trying to work out what my new “normal” is, and how and if work can fit around that. I currently suffer from chronic pain and chronic fatigue. Apart from quick trips to the supermarket at the end of the road, I’m only managing to leave the house on average once a week. This is a very new way of having to live my life and it’s taking me some time to get my head around it. 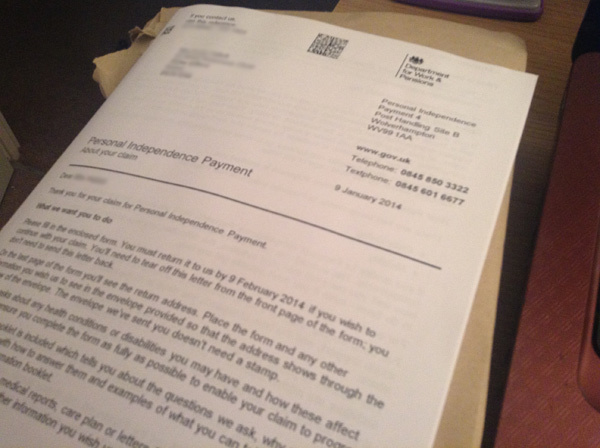 Today, my application form for Personal Independence Payments arrived. Personal Independence Payment, (or PIP) is the new version of Disability Living Allowance that anyone who is making a new claim has to apply for. It’s a 40-page document that asks you to describe the minutiae of every day, and how your condition makes things worse for you. I was a professional, working towards my Masters Degree in my chosen subject, self-employed and working. I’m now barely able to leave my house. I want to document my journey through transitioning from working professional to chronically ill person. I am the person whose life turned around in a small amount of time because they got ill and had to work out if they were still going to be able to work. I have until the February 9th to finish my PIP form. My appointment with the rheumatologist isn’t until February 26th, but I figure it’s better to get things started now.